By doodle, April 8 in HELP NEEDED! Hello all, I have really gone down memory lane reading your posts on old Nottm. Many many years ago I lived and worked in Nottm. I am soon to collect my OAP! and need some info on a couple of places where I worked but sadly the brain is not giving me any clues and so I hope someone here can help. My first job in 1970 was in a factory off the Alfreton Rd somewhere called I think Perrys or Perry & Co they made lingerie for M&S amongst other stores. I worked on the top floor as a trainer pattern designer with Delia who layed up the fabric and Janet a machinist who made up the samples and I think the supervisor was May. Mrs Perry ran it and her son John Perry looked after the store room. I need the address and the correct name of the company for my DWP OAP form! Another place I worked for a very short time was in the Victoria Centre. 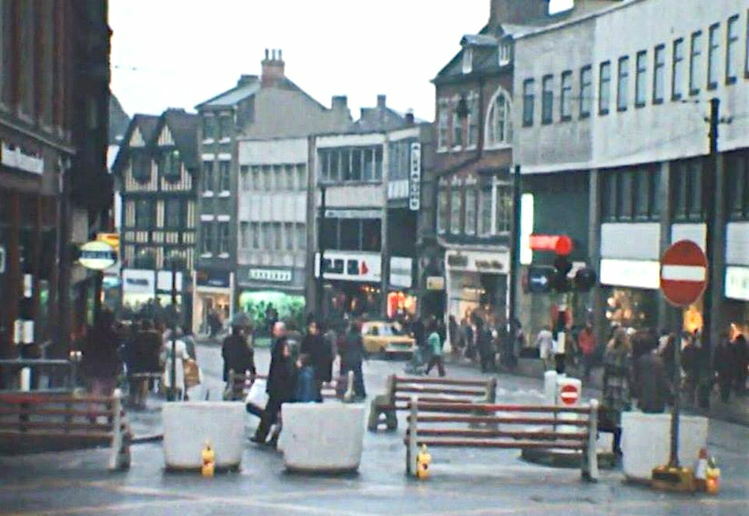 It was a menswear shop opposite Cecil Gee at the top end entrance/exit of the Victoria Centre, I think it might have been called Peter Brown? If anyone could confirm the name that would be great. I also, shopped at Birdcage, Wardrobe (don't think anyone's mentioned that one yet) and Bus Stop and when money was tight Chelsea Girl or a department type store, can't remember the name next to Boots the Chemist opposite Sisson & Parker stationers (well I think that's what it was called.) There was also a little cabin that sold cigs and chocolate which was a daily call but I can't remember that much either! I've moved around quite a bit! Looks like it was Chelsea Girl (behind the yellow van). Interests:Staying alive, family and travel. Richard Shops was on Wheeler Gate near Chelsea Girl. Interests:Music , mainly old Stax and Motown but love The Beatles and The Beach Boys too . Retail past, present and future . Thanks to all for your quick responses. I've check where Russell Street is and yes I think you've found it for me. I've also looked at some old photos of that area on google and there is an old factory builiding with turrets at either end which I remember the factory where I worked had said turrets as I used to go up the stairs in the turret at one end, collect the sandwich orders from the machinists on the various floors and then come back down the other turret staircase. I used to walk down the Alfreton Road from Canning Circus and then cut through into maze of streets where Russell Street is. At lunch time if I didn't go into the canteen I went with some others to a little cafe on the Bentinck Road for a bacon sandwich! Oh er memory lane! Go To Topic Listing HELP NEEDED!